More than one university professor has cast doubt on the existence of King David and the ancient Kingdom of Israel. Academics are prone to say David was the Jewish equivalent of King Arthur, the stuff of myths and legends. Once again, archeology is proving these doubts wrong. An inscription on a pottery shard found near the valley where David slew Goliath offers evidence that the books of the Old Testament are much older than academics previously thought, and scribes certainly could have been recording the lives of David and his sons 3000 years ago. 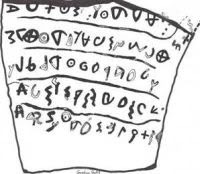 An inscription on a pottery shard dating to the 10th century BC has been declared to be in Hebrew. Not only does the ancient language on the shard use certain words specific to Hebrew, but the inscription speaks about taking care of the weaker people in society - widows, orphans and strangers - and calls for the king to get involved. Other Middle East cultures of the time did not promote the protection of the weak; these were ideas unique to the Old Testament and the Hebrew culture. Professor Gershon Galil of the Department of Biblical Studies at the University of Haifa, who deciphered the inscription, argues that this pottery shard offers evidence that the Kingdom of Israel was indeed in existence in the 10th century BC (the time of David), had a king, and had people capable of writing down histories. It therefore gives evidence to something some of us have never stopped believing, that the Scriptures are as old as they claim to be, despite what modern day scholastics may think. "It can now be maintained that it was highly reasonable that during the 10th century BCE, during the reign of King David, there were scribes in Israel who were able to write literary texts and complex historiographies such as the books of Judges and Samuel," Galil said. Galil points out that the shard was found in Khirbet Qeiyafa, a rural Judean town near the Valley of Elah. He argues that if scribes out in the country were able to write the complex text found on this pottery shard, a number of capable scribes would have also lived in central Judea and in the city. This contradicts many academics who have argued that the Hebrew Scriptures could not have been written before the Babylonian captivity because of widespread illiteracy. While the inscription does not match any exact Old Testament passage, the gist is similar to ideas expressed in verses like Exodus 22:21-23; 23:3, demonstrating a flow of ideas in line with what Scripture taught. Academics have long complained that the great kings David and Solomon did not really exist because archeological evidence of them has not popped up all over Israel. Yet, conquest during the time of the kings, destruction of Jerusalem and the Temple by the Babylonians, Israel's years of being a battle ground between Syria and Egypt, the destruction of the 2nd Temple and eventually the razing of Jerusalem by the Romans all would have played a big part in wiping out the majority of King David-related artifacts. King Solomon's golden shields (1 Kings 10:17) would have been long gone. Still, David's story remained safe in the Scriptures, protected and fastidiously copied down through the centuries. This new inscription offers evidence outside the Scriptures by establishing that the Israelites of David's time had writing capabilities. It isn't alone; there are other evidences of ancient Israel outside the Bible. The Tel Dan Stele describes the victory of a king of Damascus over a "king of Israel" and a king of the "House of David" during the 9th century. (After King Solomon died, Israel was split into the Northern Kingdom of Israel and Southern Kingdom of Judah, which was ruled by the descendents of David.) The Mesha Stele, excavated at the capital of ancient Moab, also declares victories over a king of Israel – Ahab, son of Omri. And the Sennacherib Prism describes the Assyrian king's attack on Jerusalem during the reign of Hezekiah – an attack which failed as described in 2 Kings 18-19. The Hebrew Scriptures are more than just Jewish history and mythology jotted down hundreds of years after the facts described. These books, penned by dozens of authors, are a consistent message from the I AM, the God not constrained by Time. The Scriptures not only provide readers with the history of Israel, but also give previews of events hundreds or thousands of years before they occur. Most importantly, they describe in advance the death of the Jewish Messiah for our sins (Psalm 22, Isaiah 53, Acts 8:26-39) and his victory and future reign on the throne of his father King David (2 Sam 7:16-17; Psalm 110:1-2; Matt 22:42-46; Isaiah 9:6-7).